Baby led weaning foods can seem confusing. You want your baby to have the full baby led weaning experience, but you also want them to be safe! Starting your baby on solids doesn’t have to be hard. In fact, I found that baby led weaning was actually the easiest method to a great nutritious start! Baby led weaning is all about allowing your baby to eat REAL food. Try your best to be a part of meal time and sit down with your little one! You and your baby will enjoy the experience of baby led weaning so much more if you’re doing it together. Click here for more tips on baby led weaning basics. 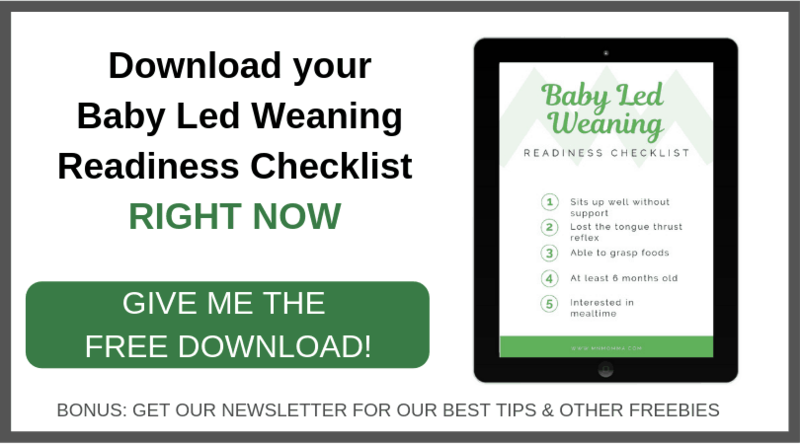 Also, be sure that your baby is ready to start baby led weaning. This typically occurs around 6 months of age and when your baby can sit up on his or her own. For more details on deciding baby’s readiness check out this article from KellyMom. 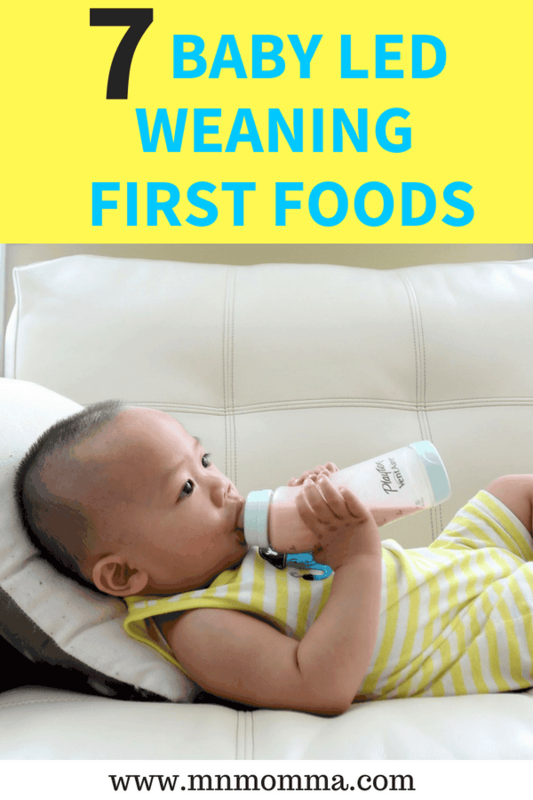 So what are some of the best first foods for baby led weaning? 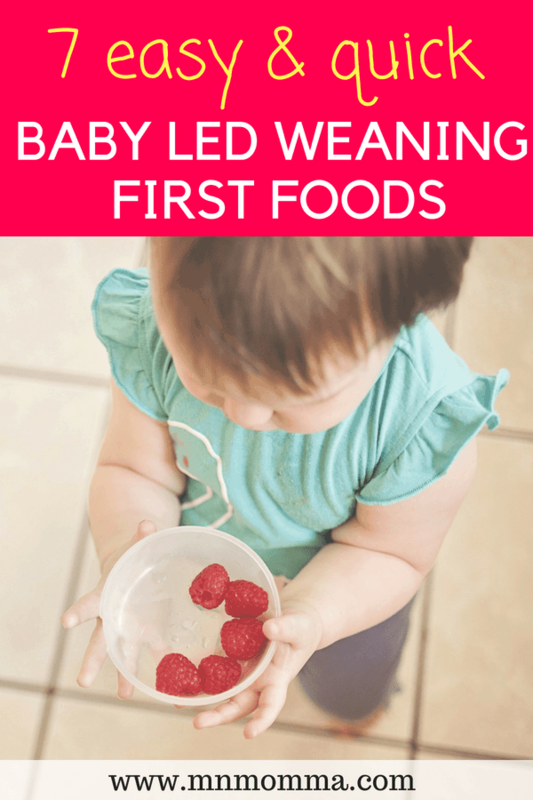 There are 7 super easy foods that are great to start your baby off right with baby led weaning! 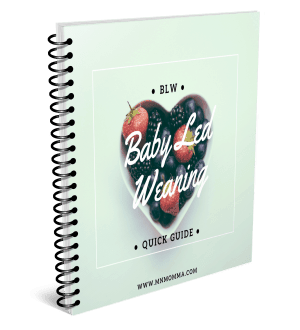 To make your life really easy, you can also check out the Baby Led Weaning Quick Guide and have a 3 month schedule of baby solids already laid out for you! 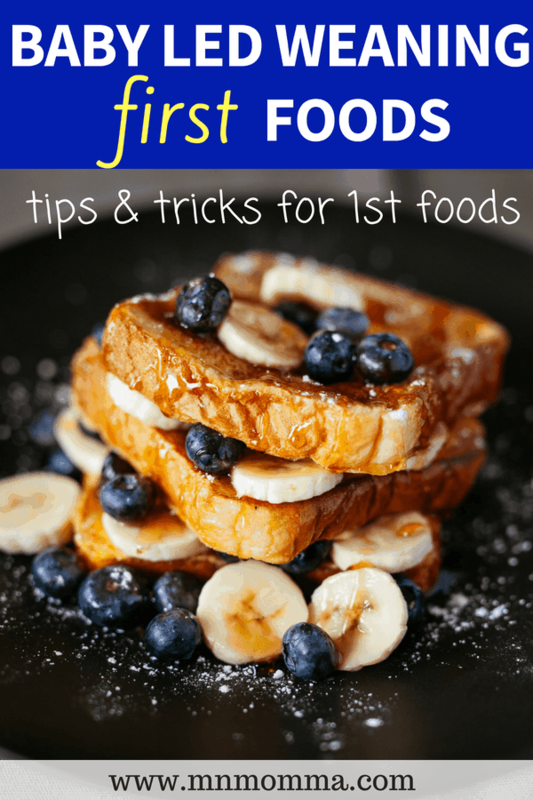 When starting your baby on solids, finding foods that are easy for your baby to grasp is the first step. Baby’s that are new to solid foods have likely not developed a perfect pincer grasp yet. However, they’re probably pretty good at an open palm grab! Make sure the foods that you cut for your baby are easy to pick up and hold on to. When possible, allow your baby a food “handle” to grasp while holding their food. A “handle” should allow your baby to be able to hold the food in their hands while still eating from an inch or two that sticks out of the top of their grasp. Another important step in baby led weaning first foods, is finding foods that can be cooked or are already soft. This is a safety issue and can help your baby eat foods without any teeth! A great gauge for this is to remember that baby led weaning foods should be soft enough that you can squish them between your fingers. 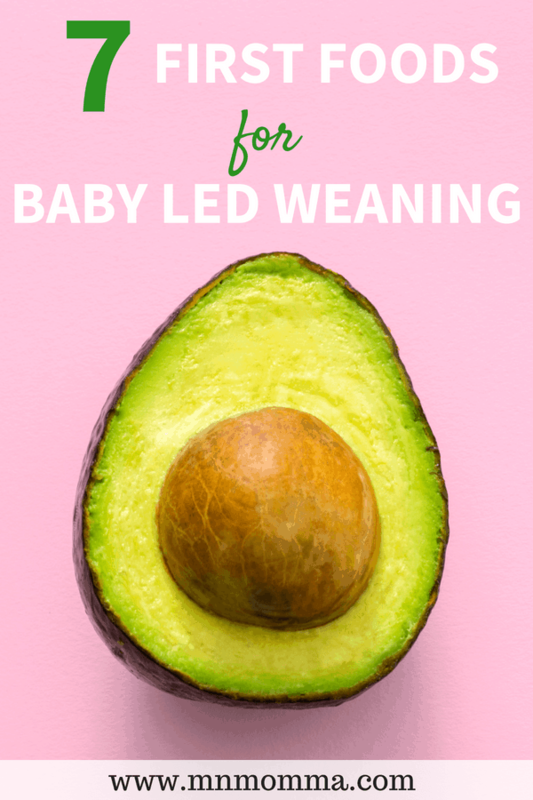 Avocado is a great first food for baby led weaning because of it’s texture and great nutritional value! Open and skin your avocado, then cut it into long finger-like slices. These slices will be much easier for your baby to hold on to than small pieces would be at this stage in development. 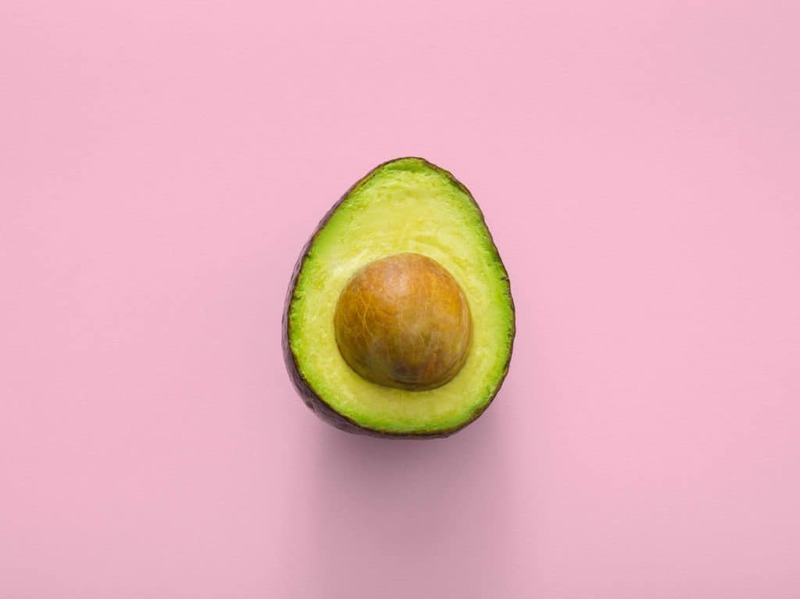 Avocados offer lots of healthy fats for your little one and is a great starter food! Sweet potatoes seem to be a staple for baby led weaning foods. They’re easy to manipulate to a size your baby can grasp and many little ones go crazy for them! Simply cut your sweet potato into long finger-like fries add a little oil for baking and stick them in the oven! Broccoli is a baby led weaning food that offers a great built in “handle”. Your baby can easily grab the stock of the broccoli and enjoy munching on the top tree portion. To prepare broccoli for your baby, steam or roast it until soft. Typically, you’ll know a food is soft enough when you can squish it between your fingers. 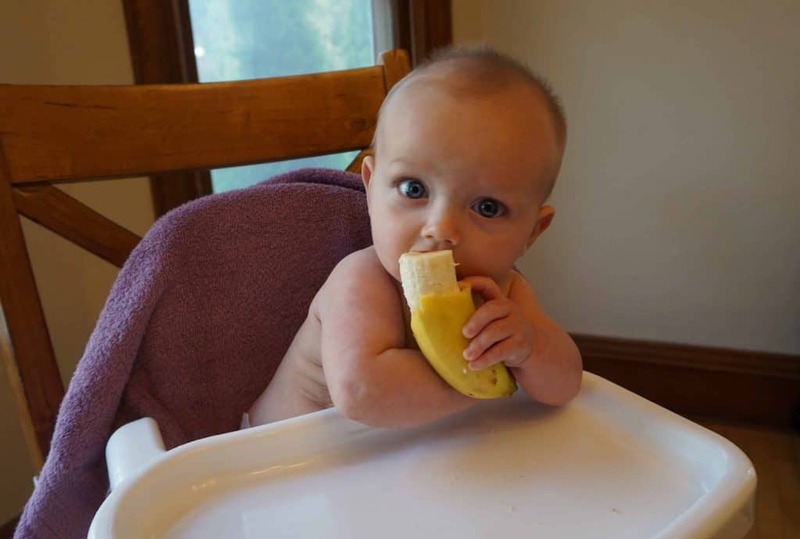 A banana is another great first solid for your baby because it offers that same “handle” and comes at the perfect level of softness! Slice your banana in half and cut a small 1 inch portion of the peel off at the top. This will help your baby hold on to the banana on the peel portion (and avoid it slipping out of their hands! ), but still get at the real banana inside. Toast with jelly, toast with hummus, toast with peanut butter (if your baby doesn’t have an allergy), toast with, well whatever! Give your baby a little slice of a variety of tastes with a piece of toast. Cut the toast into long strips and let your baby give it a try! Allergy Note: We did start our baby on peanut butter before he was 1 year old. We don’t have any family history of allergies, had talked with our pediatrician, and did some research. We are excited to report, that so far, we haven’t encountered any food allergies! This article on peanut butter introduction from the American Academy of Pediatrics is super interesting for parents starting their babies on solid foods. I definitely recommend giving it a read if you’re trying to decide when to give certain foods. Tomato slices are another one of the incredibly easy baby led weaning foods you can try. Simply slice a tomato and set it on your baby’s plate! They’ll love sucking the juice out of the tomato and you’ll feel good knowing they’re eating something healthy. Once your baby gets more advanced, you can try grape tomatoes that are cut into small pieces. This awesome gadget has been a lifesaver for us – I just might have to add it to my baby led weaning must haves list. We use it to cut grapes and cherry tomatoes in SECONDS! It’s also super easy to throw in the diaper bag and take on the go. I can’t tell you how many friends we have who are amazed at this little tool – and it’s less than $10. Pasta can be a fun and easy first food for babies. Typically penne pasta or rotini will be easier for your little one to pick up, but feel free to experiment! Our baby ended up preferring spaghetti to any other type of pasta. If you’re feeling ambitious – try making a healthy alfredo, cheese, or meat sauce for your baby to go with the pasta. It’s best if you can make one from scratch to avoid the high levels of sodium that are often found in canned or pre-made pasta sauces. Aside from knowing which starter foods are easiest for your baby, try to keep track of what he or she has already tried. 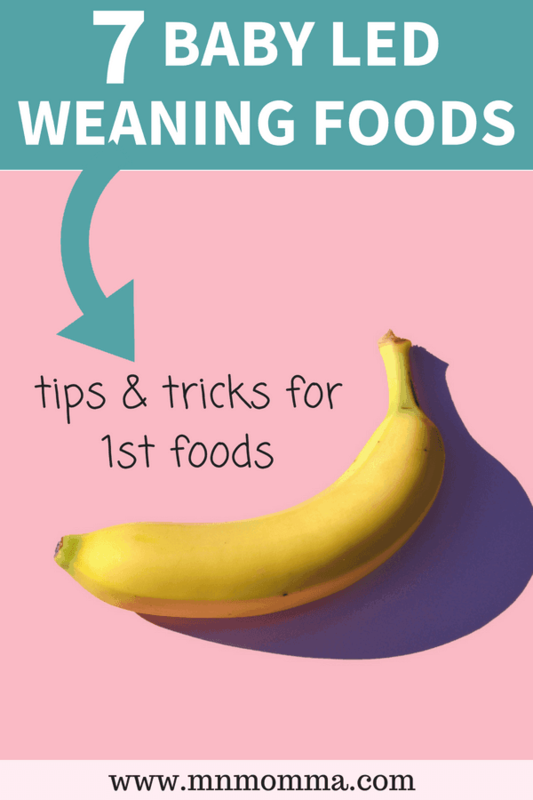 I love this Baby Led Weaning Quick Guide for keeping track of the foods my baby has tried and knowing when to add a new food! 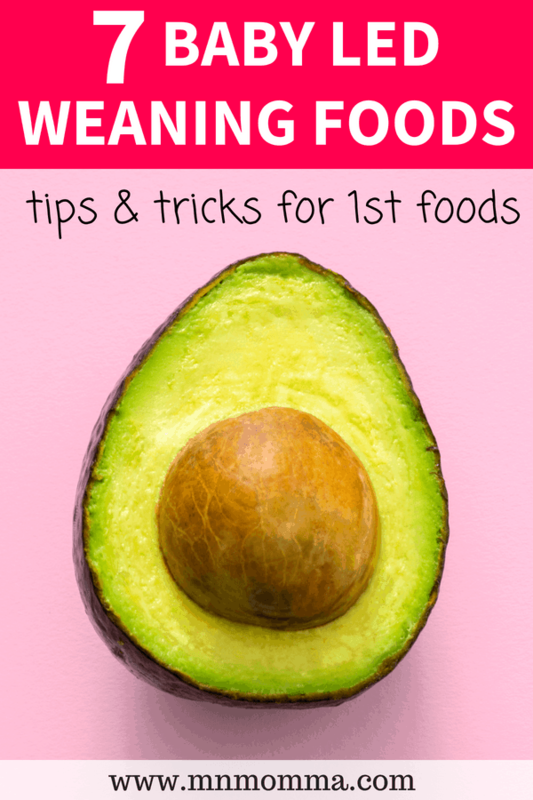 If you don’t have a family history of allergies and your baby is doing well with his first baby led weaning foods – don’t be afraid to speed up the process! Add breakfast to the mix, or let your baby try a couple new foods at once. If you’re watching for allergies, make sure you only introduce one new food every few days and talk with your doctor about your plans to introduce solids through baby led weaning. If your baby isn’t interested in eating the food, that’s okay! The whole idea behind baby led weaning is play and experimenting. Your baby should be getting all his or her nutrients from breast milk or formula. Any added solids that he or she gets is a bonus! One of my favorite resources to grab is this Baby Led Weaning Book. I keep it by my bed and love the troubleshooting section. If there’s something you’re not sure about, Gill and Tracy probably wrote about it. It’s also always important to talk to your pediatrician and daycare provider about baby led weaning. Make sure they both know your plans and discuss any safety concerns you or they might have. Baby led weaning is an incredible experience, but you need to make sure your baby will always be safe!